Intimidation Clothing moved through the holiday weekend and into the first weekend of December with one of the most successful weekends in recent memory, including two fighters winning high profile fights and a successful event in the Steel City. At Pinnacle FC’s “Pittsburgh Challenge Series 5” just outside of the Steel City, Intimidation Clothing served as an event sponsor and was on hand selling its popular brand of t-shirts, hats, hoodies, fight shorts, and more. With a continued focus on the Pittsburgh market, Intimidation also had Team Intimidation unbeaten pro fighter Mark “The Pride of Bloomfield” Cherico signing autographs at its official booth. At the Pinnacle FC event, Intimidation also sponsored the winning of the evening’s main event, as TUF 16 veteran Julian “Night Train” Lane (6-3-1) took home a unanimous decision victory over Joey Holt (3-1). Lane now has some momentum with his sixth career victory and a 2-1-1 record in his last four outings. At the Tuff-N-Uff event in Las Vegas on Friday, Team Intimidation’s Jessica Zomcik (9-3) closed out her amateur career by winning the organization’s 145-pound title with a second round TKO victory over Shannon Reed (2-2). The wins sees Zomcik joins an impressive list of former Tuff-N-Uff women’s champions including Rondy Rousey and Jessamyn Duke. Zomcik is now planning to make her professional debut sometime in 2014 and has already been contacted by multiple high profile organizations as she is currently ranked as the #1 amateur female featherweight in the world. Intimidation Clothing continues the grind as the biggest supporter of Local MMA this weekend with events sponsored in Buffalo, New York as well as both Akron and Fredericktown, Ohio, in the USA and a MMA event in Essex, England. Meanwhile, on December 13th Intimidation will sponsor MMA events in Erie, Pennsylvania and the live televised XFC 27 event in Muskegon, Michigan. Intimidation Clothing is a fast-growing brand of lifestyle apparel & MMA training gear with a growing national presence and over 50 authorized dealers across the USA. Known as the biggest supporter of local MMA, the Intimidation brand is also regularly featured on multiple sporting events on SpikeTV, AXS TV, SportsTime Ohio, MTV2, FUEL TV, The Comcast Network, Comcast SportsNet and EpixHD as well as MMA highlight shows on Spike TV, AXS TV and more. In addition to over 110 styles of high-quality, bold t-shirts and sweatshirts for men, women and children and is also known for their premium-quality EliteFighter MMA board shorts. Anyone interested in becoming a dealer can apply to sell the Intimidation brand as a dealer and they can be found for sale online at IntimidationClothing.com. Fans can also follow the marketing wing of the Intimidation brand, Intimidation Interactive Media, @IntimidationIM, like Intimidation Clothing on Facebook or follow @IntimidationMMA on Twitter. Intimidation Clothing is pleased to announce its sponsorship of professional fighter Julian “Night Train” Lane in his upcoming bout near Pittsburgh on November 27. Lane (5-3-1) is set to take on Joey “The Hitman” Holt (3-0) in the main event of Pinnacle FC’s “Pittsburgh Challenge Series 5” in the Steel City on Thanksgiving Eve. A veteran of The Ultimate Fighter 16, Lane also competed once for Bellator MMA, where he stopped Joe Heiland with a guillotine in the first round at Bellator 66 in April 2012. He started a busy 2013 with a loss to Nick Duell in March fighting for the NAAFS then scored a first round submission over James Reese at Fight Time 15 in Florida in June. A fan favorite in Mansfield, he recently returned to his hometown for the first time since 2011, when he fought to a draw with fellow Bellator veteran Rocky Edwards at RFO: Big Guns 12 Resurrection. Most recently, he dropped a close decision to unbeaten fighter Paul Felder in at CFFC 28 in Atlantic City less than a month ago. Known for his aggressive striking and power, Lane looks to add to the win column against the undefeated Holt as he fights for the Pinnacle FC promotion for the first time. Along with sponsoring Lane, Intimidation is also set to sponsor the Pinnacle FC 5 event. Team Intimidation will also be on hand with an official booth selling its popular brand of t-shirts, hats, fight shorts, hoodies, and more. The popular Steel City shirt will be available, as will the Support Local MMA tee. Intimidation Clothing is excited to announce its sponsorship of Pinnacle FC’s upcoming “Pittsburgh Challenge Series 5” event on November 27 at the Iceoplex in Canonsburg, Pennsylvania. One of the fastest-growing promotions in the Ohio Valley region, Pinnacle will make its fourth appearance of the calendar year, with each of its previous 3 events being more successful than the last. The PFC 5 card is one of the deepest in organization history, including multiple Intimidation sponsored fighters and fast-rising prospects in the area. In the main event, Intimidation sponsored pro Julian “Night Train” Lane (5-3-1) is set to take on Joey Holt (3-0). Lane (pictured), a veteran of Bellator MMA and The Ultimate Fighter 16, comes in looking to bounce back from a close decision loss to Paul Felder less than a month ago. The card also features a deep amateur lineup including 4 title bouts and the semifinals of a 4-man welterweight title tournament and multiple fighters from the popular Fight Club Pittsburgh gym. Intimidation will also be on hand with an official booth selling its popular brand of t-shirts, hats, hoodies, fight shorts, and more. The popular Steel City shirt will be available, as will the Support Local MMA tee. It was a busy weekend for Team Intimidation, with fighters competing in different corners of the world and on large shows. Most notably, longtime Team Intimidation member Billy “Mojo” Horne (12-4) made quick work of Kelly Pennington (2-3) in the main event at Absolute Action MMA 35 in Northern Kentucky. The Cincinnati native submitted Pennington in less than two minutes with a rear naked choke. A Strikeforce and Bellator veteran, Horne (pictured with fans, right) made his first appearance in nearly a year, as he also submitted Trey Houston with a rear naked choke in the first round in his last outing at Bellator 78. Also, new Team Intimidation member Lee Morrison (13-3) was victorious at M-1 Challenge 42 in St. Petersburg, Russia, as he earned a split decision over Mikhail Malyutin (27-11). The Washington product was also featured in MMAjunkie.com’s ‘Fight Path’ series leading up to his fight and is one of the newest member of Team Intimidation (pictured, left). At ONE FC 11 in Singapore, Ohio native Cody “The Wolverine” Stevens (11-6-1) came up just short in the biggest fight of his life, as he dropped a unanimous decision to veteran Shinya Aoki (34-6) in the night’s co-main event. In Intimidation Alumni news, Jessica “Evil” Eye (11-1) was victorious in her UFC debut, as she took home a split decision win over former Strikeforce champion Sarah Kaufman (16-3) at UFC 166 in Houston. Two other Intimidation Alumni – heavyweight Eric Prindle and welterweight Karl Amoussou – came up short at Bellator 104 on Friday night. Meanwhile, the Intimidation crew was live in Parma, Ohio near Cleveland at the PRIME Wrestling “Wrestlution” event where a large crowd took in some Independent Circuit pro wrestling on Sunday afternoon. Upcoming this weekend, Team Intimidation will be busy at the Cage Fury Fighting Championships 28 event in Atlantic City, New Jersey as sponsored fighter and “The Ultimate Fighter 16” veteran Julian “Night Train” Lane (5-2-1) is set to take on undefeated prospect Paul Felder (5-0), and top female prospect Rebecca Heintzman (0-0) will make her pro debut after a perfect 6-0 amateur career. Also, Team Intimidation alum and UFC veteran Charlie Brenneman (18-5) will take on Kyle Baker (11-4) for the CFFC lightweight title in the main event. Intimidation Clothing is pleased to announce its sponsorship of Julian “Nitrane” Lane in his upcoming bout on October 26th. Lane (5-2-1) is set to travel to Atlantic City, where he will take on Paul Felder (5-0) in a featured professional bout at Cage Fury Fighting Championships 28. A veteran of The Ultimate Fighter 16, Lane also competed once for Bellator, where he stopped Joe Heiland with a guillotine in the first round at Bellator 66 in April 2012. He started a busy 2013 with a loss to Nick Duell in March fighting for the NAAFS then scored a first round submission over James Reese at Fight Time 15 in Florida in June. A fan favorite in Mansfield, he recently returned to his hometown for the first time since 2011, when he fought to a draw with fellow Bellator veteran Rocky Edwards at RFO: Big Guns 12 Resurrection. Known for his aggressive striking and power, Lane looks to add to the win column against the undefeated Felder as he fights for the CFFC promotion for the second time this calendar year. Along with sponsoring Lane, Intimidation is also set to sponsor veteran amateur fighter Rebecca Heintzman in her professional debut at the event against Allison Haynes (0-0). Intimidation Clothing continues to be the biggest supporter of local MMA, as not only did the company release two new versions of the Support Local MMA tee this past week, but several fighters and events were sponsored over the Labor Day weekend. Among the sponsored fighters were Mansfield natives Cody “The Wolverine” Stevens and Josh “The Honeybadger” Longood, who were two notable winners at the Intimidation-sponsored RFO: Big Guns 12 Resurrection event over the weekend. Along with serving as a title sponsor and being on hand for the RFO event in Mansfield, Ohio, Intimidation also sponsored several fighters on the card. Stevens (11-5-1) was victorious in the night’s main event, as he took home a majority decision over UFC and TUF veteran Dustin Neace (25-21-1) in his return to his hometown. Stevens’ teammate Longood (6-1) successfully defended his RFO featherweight title with a second round TKO stoppage victory over Chris McKinney (6-2) in the night’s featured amateur bout. For his win, Longood also earned Submission of the Night honors. Two other Intimidation sponsored fighters were also in action in the night’s co-headliner, as Bellator MMA veteran Rocky “The Number” Edwards (4-2-1) and TUF vet Julian “Night Train” Lane (5-2-1) fought to a split draw. For more information on the RFO event, check out full coverage on OHMMA.com. This upcoming weekend will also be a banner weekend for the Intimidation brand, as multiple fighters will be sponsored on national TV and internet streams. First up, Intimidation cornerstone fighter Brian “The Professional Predator” Rogers will continue his quest toward Bellator MMA gold, as he takes on Mikkel Parlo (9-1) in the opening round of the Season 9 Middleweight Tournament live on Spike TV this Saturday. Pre-orders for the new Brian Rogers signature tee are also still underway. Also sponsored will be UFC veteran & Colosseum Combat welterweight champion Ryan “The Tank Engine” Thomas (16-7), as he looks to go 3-0 for XFC when he faces Ian Stephens (2-0) on the XFC 25 main card live on AXS TV on Friday night. And finally, highly touted Muay Thai prospect Marcus Fisher will compete for the WBC super middleweight national title when he faces Cyrus Washington at Warriors Cup XVIII live on gfl.tv this Saturday. Intimidation Clothing is pleased to announce its sponsorship of featherweight Cody “The Wolverine” Stevens in his upcoming bout on August 31st. Stevens (10-5-1) is set to take on TUF 14 and UFC veteran Dustin Neace (25-20-1) in the main event at RFO: Big Guns 12 Resurrection in his hometown of Mansfield, Ohio. His walkout shirt (pictured, right), Intimidation’s new red, white and blue International tee, will be available throughout the night at the Intimidation booth. A longtime veteran of the Ohio MMA scene, Stevens will return home after a year training in Thailand to compete in the bout. Fighting in Mansfield for the first time since March 2012 when he submitted Anthony Durnell in the first round, Stevens is set to face perhaps his toughest test to date when he welcomes Neace to the RFO for the first time. A member of The Fight Farm in Mansfield, Stevens owns notable wins over Durnell, Adam Ward, and UFC veteran Donny Walker. Most recently, he competed in Australia in April, when he won his bout via submission in the second round. Along with sponsoring Stevens, Intimidation is also set to sponsor TUF 16 veteran Julian Lane in the co-main event, as well as RFO featherweight champion Josh Longood in the amateur main event. Intimidation will also be on hand selling its popular brand of t-shirts, hats, hoodies, fight shorts, and more with an official booth. Intimidation Clothing is pleased to announce its sponsorship of Julian “Night Train” Lane in his upcoming bout on August 31st. Lane (5-2) is set to return to his hometown of Mansfield, Ohio, where he will take on Andrew Law (3-1) in the co-main event at RFO: Big Guns 12 Resurrection. A veteran of The Ultimate Fighter 16, Lane also competed once for Bellator, where he stopped Joe Heiland with a guillotine in the first round at Bellator 66 in April 2012. A fan favorite in Mansfield, he will compete in his hometown for the first time since 2011, when he defeated Mike Williams to earn the RFO amateur lightweight title. Known for his aggressive striking and power, Lane looks to build on his first round submission over James Reese at Fight Time 15 in Florida two months ago. Along with sponsoring Lane, Intimidation is also set to sponsor Mansfield natives Cody “The Wolverine” Stevens in the main event and Josh “The Honeybadger” Longood in the amateur main event, respectively. 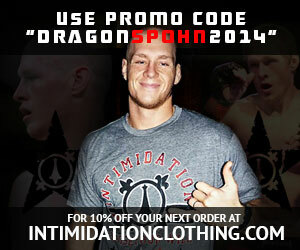 Intimidation will also be on hand selling its popular brand of t-shirts, hats, hoodies, fight shorts, and more. Intimidation Clothing is pleased to announce that it will sponsor and sell at the upcoming RFO: Big Guns 12 Resurrection event on August 31st in Mansfield, Ohio. One of the top and longest-runnning promotions in the state of Ohio, RFO will hold its first event since November 2012, and it will be one of the biggest events in the organization’s history. Along with sponsoring the event, Intimidation will also sponsor two hometown favorites who will compete in the night’s main and co-main events. Cody Stevens (10-5-1), fresh off of a year training in Thailand, will make his first appearance for RFO since March 2012, when he submitted Anthony Durnell in the first round. Stevens is set to take on TUF veteran Dustin Neace in the night’s main event where he will be sponsored by the Intimidation brand for the first time. Also sponsored will be TUF 16 veteran and Mansfield native Julian Lane (5-2), who is set to take on Andrew Law (3-1) in the night’s co-main event. Intimidation is also set to sponsor popular local amateur Josh Longood (5-1) in the amateur main event, as he is set to defend his RFO featherweight title against Chris McKinney (6-1). Intimidation will also be on hand selling its popular brand of t-shirts, hats, hoodies, fight shorts, and more, including the company’s popular new Support Local MMA tee (pictured).